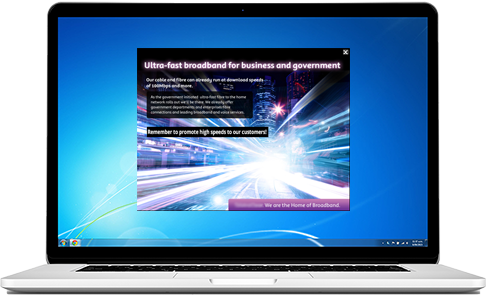 Telstraclear is a large telecommunications company, providing innovative market-leading products, services and customer focus to the business, government, wholesale and residential sectors. In a bustling, pressurized corporate environment, getting important information to staff when they needed it was challenging. The volume of emails received by staff made it difficult for messages to cut through the email clutter. TelstraClear needed to be able to alert staff immediately when a situation arose and equip them with information required for their role. For Diane Robinson, Head of Communications, that meant reducing email traffic and finding a more effective internal communications solution. 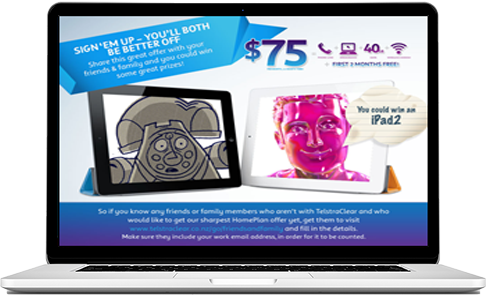 TelstraClear introduced three SnapComms channels to address their communication challenges. Digital internal newsletters offer a rich multimedia format for creative storytelling and building brands internally. To reflect their internal brand, TelstraClear were keen that the tools appeared visually interesting and attractive, and that the tone was friendly. A series of visual templates were developed for specific audiences, so that each had a specific look and feel. Screensavers were used to reinforce key messages and corporate information, including current sales promotions, staff benefits, offers, organizational values and customer profiles. A series of bright, fun and colorful screensavers were changed regularly to maintain their impact and interest. They were met with overwhelming appreciation and enthusiasm by staff. A corporate newsletter was developed to go to all staff, including news and information from across the organization. A regular feature is the weekly ‘Upfront’ section about company initiatives and direction, penned by a member of the Leadership Team and generally refers to company initiatives and direction. In emergency situations like fire alarms when messages required more immediacy, pop-up alerts were designed using ‘emergency’ colors of oranges and reds. These alerts were used sparingly so that they are recognized as signals for immediate action, and not just as an alternative to email. “There was a need for a tool that would add flexibility to the suite of disaster response and issues communications, and the pop-up alerts tool has achieved this”, said Robinson. However, to encourage buy-in, and to ensure that the pop-ups are also a way of delivering positive reinforcement, the team have developed a ‘Birthday’ version. During the month of their start date with the company, every staff member gets sent a pop-up with a message from the CEO recognizing their tenure. The staff response to and success of the SnapComms tools has continued to grow. More and more of the organization's managers are now able to see the benefits, and the ways in which they can adopt the tools to improve their own communications. We’re delighted with the way the tools have helped us improve our communications across the organization, break down silos and help create an all-important team atmosphere across the group.